It's been fun posting all these different breakfast ideas for Farmhouse Breakfast Week and I think I may even have convinced a couple of people that breakfast is worth a few extra minutes to make. If you have seen my post about Bircher Muesli Yogurt you will know that we are creatures of habit and generally eat muesli Monday to Friday. On a Saturday we will vary what we eat, sometimes eggs, sometimes porridge or other cereals. However on Sunday, unless we have visitors when we might have a full 'Scottish' breakfast, we will usually have a bacon roll and lots of coffee. 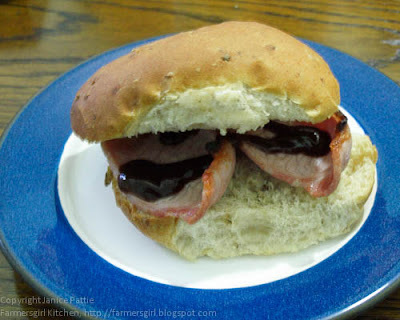 A nice granary roll from a local bakery, two slices of grilled smoked bacon and a squirt of HP sauce! 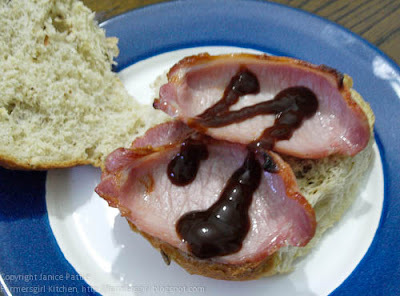 Brian goes for tomato sauce, but for me the spicy flavours of HP sauce go perfectly with the salty, smoky bacon. I hope you have enjoyed Shake up Your Wake up with Farmhouse Breakfast Week. If you’ve been taking part in the Breakfast Week Challenge then you can submit your entries now! Just fill in this form to tell them what you ate for breakfast each day during Farmhouse Breakfast Week (from Monday 21st – Friday 25th January 2013) and how it made you feel. You could win a luxury break!